Holm Court Care Home in Kesgrave is celebrating after winning the inaugural Suffolk Care Home Olympics. The competition saw seven care settings compete in three sports (Boccia, fishing and curling) over a six-week period during August and September. Delivered by Suffolk social enterprise Elatus Sports, and supported by Suffolk County Council’s Most Active County programme, the purpose of the initiative was to give care home residents a fun and enjoyable experience of sport while also highlighting the importance of physical activity within social care settings. Points were awarded in each sport with the cumulative total determining the overall winners. Holm Court triumphed in both Boccia and fishing ahead of Barham Care Centre and Mildenhall Lodge Care Home respectively. 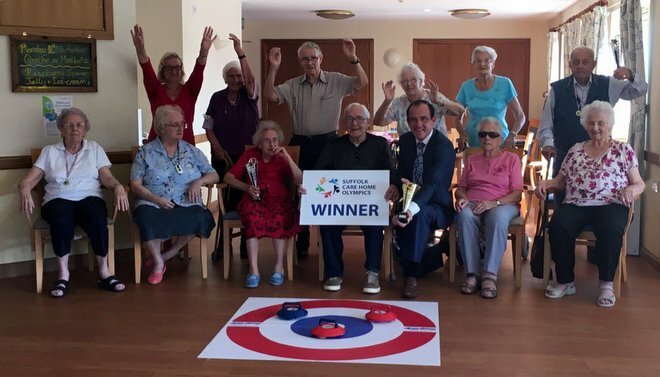 The curling competition was won by Uvedale Hall Care Home in Needham Market who beat Mildenhall Lodge into second place. In the overall competition Holm Court triumphed by just one point over runner-up Uvedale Hall.